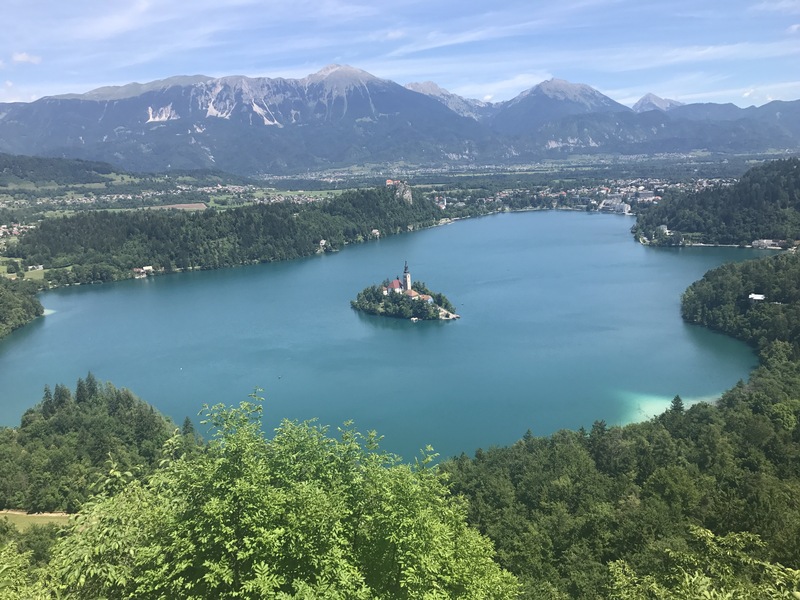 Leave a Comment on 48 hours in Lake Bled! When you only have a short amount of time to explore this hidden gem in Slovenia! Now, if you follow me on Instagram (quickly plugging, my account is @rachelbarbara) you will see how obsessed I became with Lake Bled and I have finally had time to tell you alllllll about the beautiful place! It is a small little town in Slovenia made up of about 11,000 people! Pretty small really! To begin with, I think the one true gem and what really makes it a special place is the recommended accommodation on offer with Busabout! We stay at Jazz Hostel and Jani (pronounced like Yani) is honestly a highlight! Jani and Urška own Jazz Hostel and they are the most welcoming people! Jani is continuously offering his help, making sure you are enjoying yourself, and always there if you have any questions at all! Also, the food on offer! Ahh! I personally believe the breakfast at Jazz Hostel, is the best breakfast on offer on the Busabout Network! There are make your own waffles with all different options for toppings, bacon and eggs, that you can make to your own liking, pre-cooked bacon and sausages, fruit, cereal, toast, juice and most importantly coffee! The breakfast is not included, however is an extra cost of €6.50, although where else are you going to find endless supplies of waffles, bacon and eggs for that price! Okay, so the plan over 48 hours. . . The coaches with Busabout arrive just after midday, so what we did. . . Chill out to begin with and grab some lunch! Because the next day and a bit is going to be full on! At 5pm, Jani can help organise a transfer for you out to Vintgar Gorge (photo below). . . It will take about an hour and a half to walk to the end and back. The reason it will take so long is because you will be stopping constantly to take photos because of how beautiful it is! It’s honestly so hard to capture the pure beauty of the gorge in a photo! It might be a little bit cool so take a light jacket/jumper with you too! By this time, you are going to want to have dinner, because you still have one more activity this afternoon! Jani offers BBQ dinners on Friday and Saturday nights. They cost about €7 for all you can eat food! The food is delicious and there are many traditional options on the menu! If there isn’t a BBQ on offer, no fret, there is a great restaurant in town that Jazz hostel has a deal with! You get 10% off all your meals, starters and drinks too! There are definitely some traditional meals on offer, as well as seafood, pastas, and quite a few different dishes! Last time I was there, I got a mushroom soup to start, pork medallions with some sides and a glass of red wine for about €17. You might be thinking this is a little bit above budget, splurge one night to eat here and you will not be sorry! The quality of the meal is great and I left feeling so full! Now you have probably seen the castle on the hill by now, and wondering the best time to visit! Anytime after 8pm, before sunset! Why, because after 8pm its free to enter the grounds and get some great views of the lake and island! And also, why would you not want to witness the beauty of the lake at this time of the evening! If you want to check out the castle grounds before this time it will be cost €12 to enter. So save yourself the money and check out the views, it’s honestly the best part of it! If you’re keen, have a few drinks back at Jazz hostel, or head out to the pubs in town. Promise that the hostel is definitely going to have the cheapest drink options though! You’ll find that sleeping in Bled, you will get some of the best sleep of your travels! Away from the hustle and bustle and most other travellers are keen to catch up on sleep of their own while staying here! Wake up slowly and enjoy your breakfast! Most things don’t open until 11am! Hire one of the boats from the little hire place near the paid for swimming pools. Jani will be able to give you a voucher for an extra hour for free! Take advantage of this, you will need it! It will be €20 and can fit 4 people, so really €5 per person for 2 hours, if you get 4 people of course! Then off you go rowing to the only island in Slovenia! You too can struggle your way across the lake like myself and Meghan in the featured photo! Once you are there you will buy a €6 ticket to enter the church and also the bell tower. I can hear you asking, “Why is the church so significant, Rachel?” Well, I’m glad you asked. Inside there is a rope where you can pull to make a bell ring. The legend of the bell dates back to the 16th century. It began with a widower who wanted to dedicate a bell in memorial of her late husband who was murdered by robbers and then had his body thrown into the lake! The widower made a bell by taking all the silver and gold in her house and melted it down into a bell. While she was on her way out to the island, her boat capsized and the bell disappeared into the late. It is said that a bell was replaced by the Pope when he heard this story and the bell is now used to make wishes on to this very day! If you listen carefully of a night time it is said you can hear the bell ringing. Every Christmas to commemorate the legend of the sunken bell there is a special event. So go ring the bell, get your good luck wish, like me. . . .
After that, you can climb up the tower to where there are many more bells, and some really nice views. If you go up around any quarter (:00,: 15,: 30,: 45) you can watch how the bell in this tower works (different bell to the previous one!) Can be interesting for some, not myself! Other traditions that you may be able to witness is weddings at the church! Which will usually involve the groom carrying his bride up the 99 stairs to the church! She is not allowed to talk while he is (probably the only time in a marriage where this will happen!) If he makes it into the church then rings the bell, it symbolises a happy marriage! I decided to wait a little bit on the staircase to see if Price Charming was coming to get me, however no such luck! After this, I would possibly skip lunch depending on what activities you wanted to do in this next little area! So you can do summer tobogganing if you do just one go down, plus your lift up it will be €8, pay the €3 extra and at least do one more! Then there are also inflatable things you can jump onto, like in the video below! There are however obstacle courses and sometimes a zorb ball you can go down! Up from where you start the tobogganing from there is a viewpoint where you can get a cool photo from! The photo is below. . .
Now have lunch! If you are staying at Jazz Hostel, I do just recommend buying some groceries and cooking something! 1. Firstly get something healthy, your body will thank you if you are only beginning or part way through travelling, 2. It’s cheaper, and 3. you are about to go on a hike! Take your swimmers though, because the hike begins down the same end as the public swimming area and if it is a hot day you will want a swim after! So head to the other campsite and walk past it, you will find yourself going towards walking trail 6. I’ll be the first to admit how unfit and lazy I am so, I didn’t find it hard exactly just had to stop every now and then for breathers. The view from the top though, magical! Have a bit a swim in this area, a lot of people also mention that this is a massive bucket list moment swimming in Lake Bled, so why not make them jealous? It’s probably nearly dinner time, again there are the two recommendation from above, (Jani’s BBQ if it’s on or Babjizob), or there is also this little pub that is kind of hidden near the bus station. I can’t remember the actual name of it, or find it but, the food was great! I pretty much got the Slovenian version of Bangers and Mash for €12 and was very, very full! Also got a stein of Radler which was about €5! Delicious! Before the coach comes through to pick you up and take you on your merry way, I highly recommend going and getting some Bled Cake! It is a cream cake, however to the residents of Bled it is the only true cream cake and is actually the symbol of Bled. Where it truly originated from is Hotel Park, and is where you can buy the original cake! Many other cafes throughout town also make the cake, however, this is where it originated! Over 60 years, they have sold about 12 million Bled Cakes! But what is in it? It is a crispy crust, vanilla cream, topped with whipped cream, another crispy layer and just the right amount of icing sugar to dust it off! Lactose intolerant? Don’t you worry! The pharmacy in town actually sells tablets that helps your body digest the dairy! This bad boy is worth it! Take two pills though and thank me later! All in all, Bled is such an amazing place to visit, even if it is for a little R&R! There are many other adventure activities that you can take place in like hiking, biking, skydiving, rafting, canoeing, and so so much more! You’ll be kicking yourself if you miss Bled! I put together a little video with most of the things I have mentioned above! The hike wasn’t included in the video but pretty much everything else is! When we were there as well Bled was holding their opening party for the summer, so we got to drink and eat with live music playing and the castle lit up in the background! Bled is what dreams are made of! If the below video doesn’t work, head over to the my Youtube channel! Click here! Previous Entry Travel is always about firsts. . .
Next Entry What it is really like living on the road.